I was happy to find sea beans in the store a few days ago; I've not had them in a long time. A sign there suggested blanching them to reduce their salt content, and I thought that they would pair nicely with a white bean (so the green of the beans would show nicely), so decided to soak cannellini beans and use them. Here is what I did. I put the beans with enough water to just cover them and bouillon cube into my Instant Pot pressure cooker and cooked for 30m. When I was ready to serve, I opened the pot slowly, and added the onion, tomato, nutritional yeast, oregano, and lemon juice. I also made Bhutanese Red rice by simmering it in a ratio of 1 part rice to 1 1/2 parts water, a little salt, and a vegan bouillon cube. 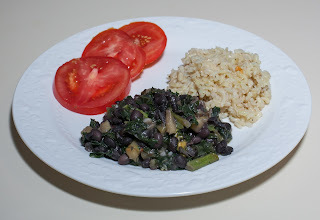 I served the main course with the rice and a simple massaged kale salad. Dinner was good! We all enjoyed it. The blanching did remove a little bit of the saltiness of the sea beans. 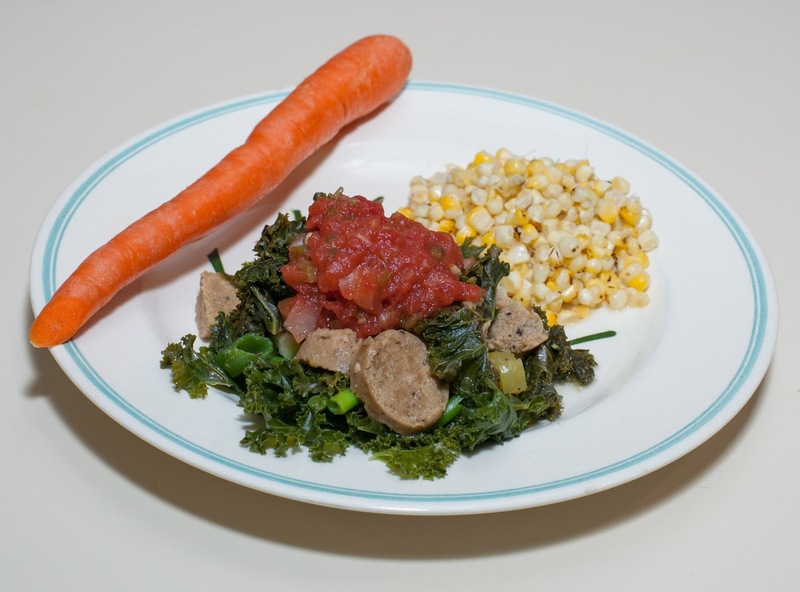 I was happy with the nutrition, taste, texture, and appearance of the meal. A little garlic would have been nice, and I could have used more lemon. My wife and I added hot sauce at the table. I purchased a chayote squash yesterday and did a little research today about it and how to cook it. 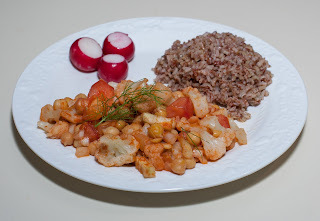 I found a nice looking chayote squash and lentils recipe and thought that I'd make something similar. We were going to be out for a few hours, so in the mid-afternoon I got lentils ready (easy - just rinse then put in the pressure cooker with 1 1/2 to 2 times as much water; I also added big chunks of potato) and set the timer to cook. Normally, lentils cook in 15-20 minutes. I thought that I would come home to just finished lentils, add the cubed squash plus big pieces of bell pepper, and cook another 2 or so minutes. However, when I came home, the lentils and potato tasted great. It was nice and thick, which I wanted. So I decided to skip the squash and work on the dish as it was, except for adding seasoning and lemon juice. Here is what I did. I put the lentils, water, potato, turmeric, and amchoor powder into my Instant Pot pressure cooker. Lentils take 15-20m; I used 15m as I was going to add squash and cook for a few more minutes. After the cooking was done, I waited a few minutes and gently released pressure. I loved the lentils and decided that the dish was basically done. I added the scallions, lemon juice, and salt, then served. I liked the nice and thick texture of the main course. It was tasty. I wouldn't add any less than this 1 to 1 1/2 ratio of water. I put all the ingredients except the onion into my Instant Pot pressure cooker and cooked for 2 minutes. After the cooking was done, I waited a few minutes and gently released pressure, then added the green onion. 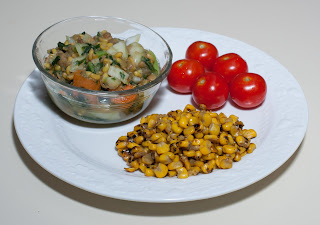 I served with a dollop of salsa (for my wife and me), as well as with some corn-off-the-cob -- my wife found our local coop had organic ears of corn. Additional greens could be used. I wanted to get dinner going and decided on a cold bean salad with avocado (then later decided to just make it guacamole, which we all love). My wife brought home some fresh corn on the cob, so that could be a nice side. 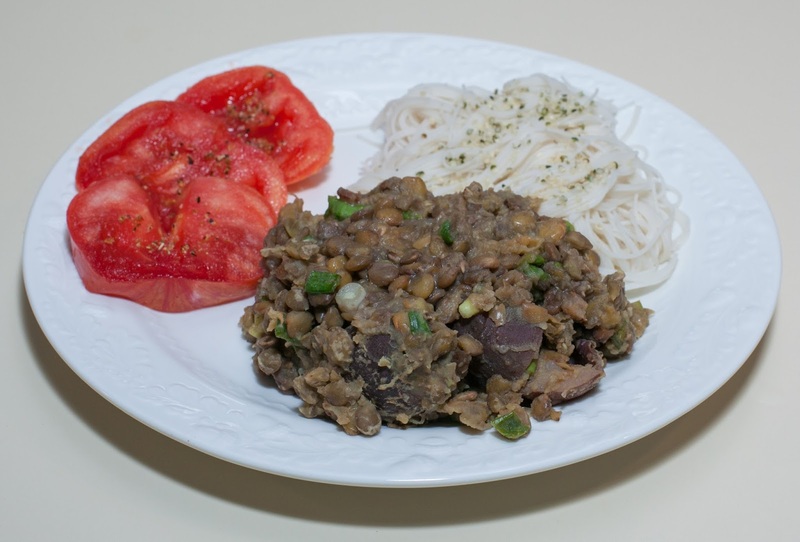 I rinsed the beans then put them in my Instant Pot pressure cooker and cooked for "zero" minutes, as described above. I let the pressure come down (so the beans were still cooking) then carefully released remaining pressure to open the pot. I rinsed the beans again. I added the garlic, bouillon cube, and enough water to cover the black beans plus another 1/4", then cooked for 30 minutes. When I was ready to serve, I gently released remaining pressure, and mixed the salt in to the beans. I served atop brown rice. My wife had made some mango puree, which I used to top the beans with. 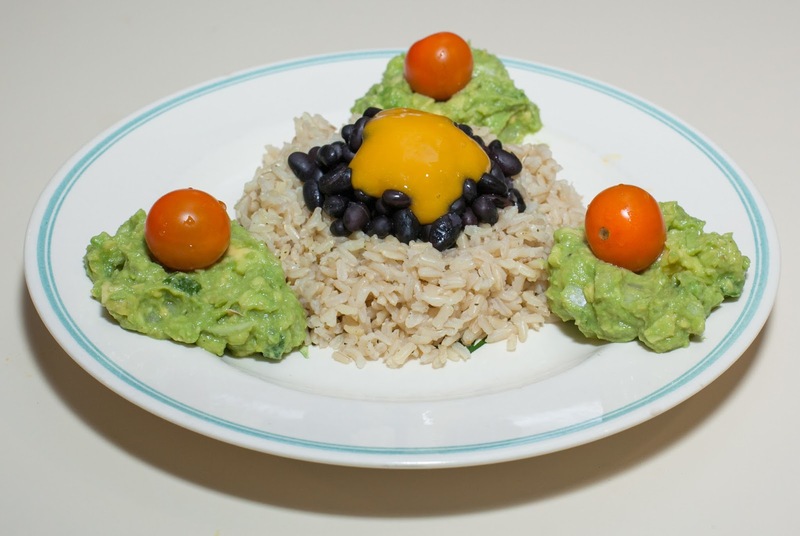 I also served homemade guacamole and (yay, now in season!) sungold tomatoes. Dinner was good. My wife didn't favor the mango with bean combination, but liked it well enough to enjoy. I should experiment with making savory fruit toppings to beans, maybe by mixing in some jerk seasoning or chunks of squash, perhaps. I made a simple dinner of edamame with fire-roasted tomatoes, onion, and ginger, served with Madagascar Pink rice. It was my wife's birthday and she wanted home cooking, our norm. I love to cook, so it was no problem! I love bean pastas, particularly the organic edamame and mung bean fettuccine that I used with dinner a few weeks ago. 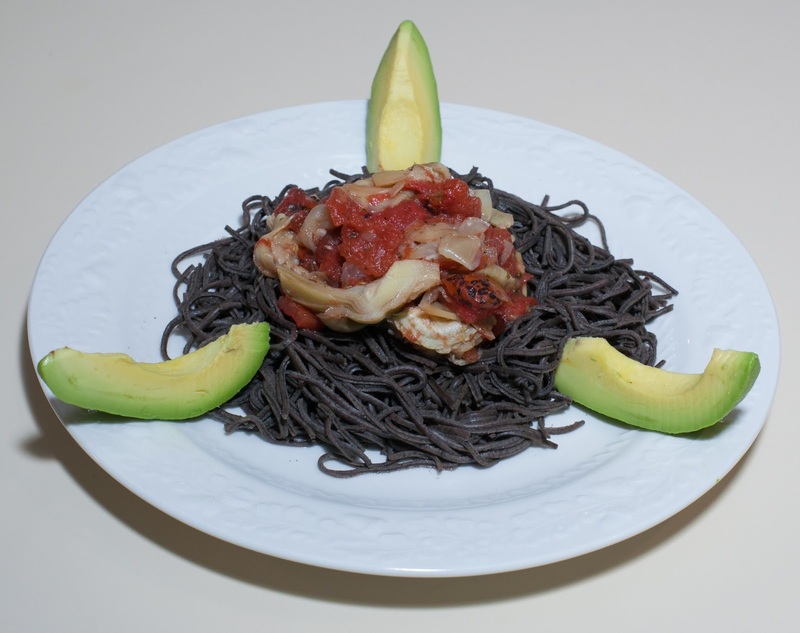 Today, I made another organic pasta from the same company today, black bean spaghetti, that has simply black beans as the one ingredient. I cooked waterlessly a bit of garlic, onion cut into half moons, and frozen artichoke hearts (i.e., I used a small Saladmaster pan, put the ingredients in, and cooked, covered, on medium till the vapor lock rattled, then reduced heat to low till the rattling stopped). After maybe 15m, I added canned roasted tomatoes, nutritional yeast, salt, and lemon pepper, and returned to a low simmer, covered. When the black bean pasta was done, I served with the pasta with the artichoke marinara atop. I should buy all the varieties of this bean pasta and explore innovative ways of serving them, such as perhaps inside winter squash or with a lemon-miso dressing. Yesterday after my Food for Life class, I went to a coop, Deep Roots Market, and was happy to find some items that I've not seen locally where I live. I picked up some ancient wheat berries; the variety is called Khorasan, but it is more commonly known by its trademarked name, Kamut. I wanted to experiment with the wheat berries and read that they cook well after being soaked overnight and then cooking, for a soup, in 3 parts water for 30-40m (5 minutes more if not soaked) under pressure. Lentils cook in a 1:2 ratio to water over 15-20m. I made a fortunate mistake and decided to pressure cook an equal proportion of wheat berries and lentils for 20m - my research would have led me to have picked 30m. I'm glad that I cooked for 20m as I loved the result! Here is what I did. I put all of the ingredients except the greens, onion, lemon juice, and salt into my Instant Pot pressure cooker and cooked for 20m. After the cooking was done, I waited a few minutes and gently released pressure, then mixed in the rest of the ingredients. Because the collards were frozen, I kept the Instant Pot in "keep warm" mode for a few minutes. When I was ready to serve, I did so along with waterlessly cooked frozen roasted corn kernels and tomato. I loved dinner, and my daughter and wife enjoyed it, as well. 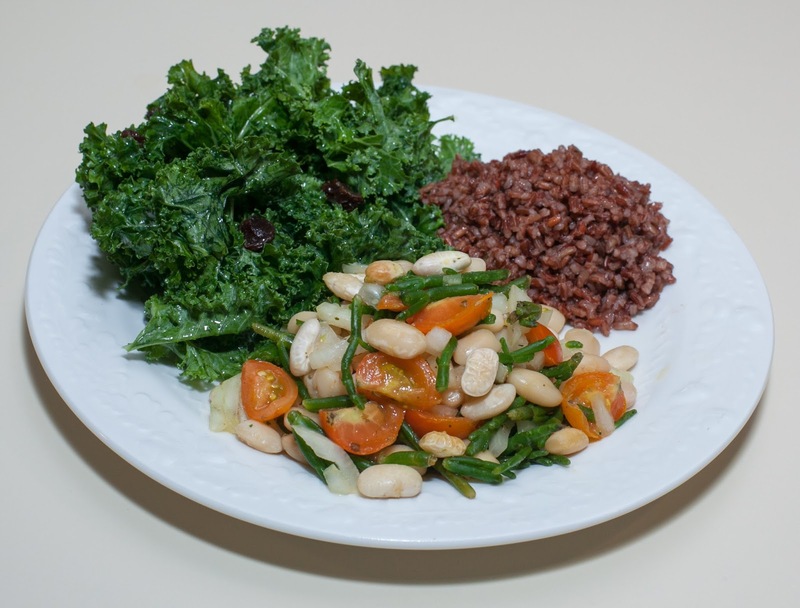 I thought that the wheat berries added a fun and interesting texture. I liked the large size of the Kamut berries. I was delighted, as well, with the consistency; I like very thick dhals, and could have served this on the plate instead of in a bowl. I should get more of these large wheat berries and explore more dishes with them. 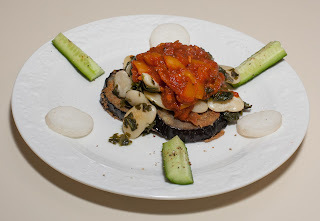 I invited some friends over for dinner tonight and decided to make a layered main course of breaded eggplant (that I had frozen and prepared) with beans and marinara sauce. The cutlets only had 2g of fat per serving of the cutlets, with 5 servings in the packet, so I'll label this dish as almost no added fat (the nutrition label linked here seems to be for another product, as mine is clearly labeled vegan with 10g of fat for eating all of the cutlets). Here is what I did. I put the beans, water, bouillon cube, and spinach into my Instant Pot pressure cooker and cooked for 28m. While the beans were cooking, I sauteed a small onion cut into about 1" x 1/2" slices on a cast iron pan with no oil and simmered a nice marinara sauce with a store-bought sauce as the base and garlic, bell pepper, some of the cooked onion, nutritional yeast, salt, and oregano mixed in. I also heated the eggplant slices in a 375°F oven for about 15 minutes. After the beans were done, I waited a few minutes and gently released pressure, then served the beans atop the eggplant, with marinara on top of it all. Dinner came out well! I forgot to add the carmelized onion (the onion came out great even without oil) and also a garnish of fennel frond when I took the picture. I think that our guests enjoyed the meal; we certainly did. Some capers with the marinara could have been nice. I wish that there were more eggplant. I should use this good breaded eggplant product more often! I wanted to use more pineapple since we bought two on sale yesterday. I also had little time to make dinner, so came up with a simple idea of cooking black beans in my pressure cooker and adding finely chopped pineapple. Here is what I did. I rinsed the beans again and had my wife put them into my Instant Pot pressure cooker with water to cover plus 1/4"; I forgot to ask her to add a bouillon cube, so just added it at the end. I had my wife have the pressure cooker go for 30m. After the cooking was done, I waited a few minutes and gently released pressure, then added the garlic, pineapple, and kale. To be sure it was nice and hot, I turned the Instant Pot on again in saute mode just for a few minutes, then added the salt, lemon pepper, garlic powder, and nutritional yeast, and served, along with brown rice. Dinner was better than I expected; we all enjoyed it. My wife and I particularly liked the main course with some hot sauce added at the table, and my daughter asked for some guacamole. I also tried a little guacamole after serving her, and it did make a good combination, reminiscent of a burrito filling. I should make a tropical black bean dish with maybe pineapple and mango. Adding some red onion and, maybe at the table, jalapeno, would be like a warm salsa. I had red curry paste leftover from Monday, as well as several cups of chickpeas that I had prepared a few days ago. Because my daughter loved the red curry dish so much (surprisingly! ), I decided to make another red curry dish. We purchased some fennel today, and that made a nice complement to the chickpeas. Here is what I did. I put all of the ingredients except the tomato and salt into a large stock pan, mixed, and cooked in a medium stock pan, covered, over low heat for about 20m. I mixed in the tomato and salt, and served with Madagascar Pink rice that I had made (1 part rice to 1 1/2 parts water, plus a vegan bouillon cube, cooked for 20m), and a salad. Dinner was good, though my daughter and wife seemed to enjoy it more than I did. I personally thought that the fennel was just a bit too much in this recipe, and I would have cut it into smaller pieces. But, overall, it was a tasty and good meal. I would use 1/8 cup of fennel for a more subtle taste. Greens would have gone great and added nicely to this dish. Perhaps a packed cup of kale added at the beginning for a cooked-in taste, or added near the end for a more fresh taste and texture, or even a more delicate green like baby spinach added after the heat is turned off and just mixed in and allowed to sit for half a minute would be good. Speaking of greens, we did get greens with our dinner. I found fresh pineapple on sale for a great price at Weaver Street Market Coop today. I blended all the core (not otherwise edible, but it blends great) and some of the rest of the pineapple with some organic strawberries that were also on sale, a little coconut water, a bit of vanilla, and kale. That was our refreshing drink that went along with dinner. It's easy to make a red curry paste, but I also like the convenience of using a vegan prepared one. Typical ingredients in the paste include cumin seed, green chilis, garlic, onions or shallots, lemongrass, salt, and lime zest. Ginger is also an ingredient, but in Thailand "galangal" is usually used, a Thai ginger with a peppery heat to it. The ingredients are simply ground together slowly with a mortar and pestle. I found a recipe online that uses a food processor instead.